It’s been nearly 20 years since a group of local Jewish leaders hosted the New England Jewish Labor Committee’s first community labor Seder. “It was a small group. We sat around the conference table at the Combined Jewish Philanthropies,” recalled Don Siegel, one of the city’s most prominent and admired labor lawyers who chaired the regional chapter of the national association. Even then, the group included trade unions from outside the Jewish community, Siegel said. The annual event fills scores of tables to what has become a “Who’s Who” of city and state political leaders, Jewish labor union activists, Jewish communal leaders, and scores of non-Jews who believe in fair wages and benefits. “The whole idea is to bring together labor leaders with JLC leaders, activists, and members and supporters to celebrate the symbolism and applicability of the Passover story as it relates to today’s workplace and today’s workers,” said Siegel, of Newton, a senior partner at Segal Roitman LLP and a past president of the Jewish Community Relations Council of Greater Boston. NEJLC’s 19th annual labor Seder, scheduled for 4 to 7:30 p.m. Sunday, April 7, at Temple Israel in Boston, will recognize Siegel, who recently stepped down as co-chair of the organization after decades serving in its leadership. He will continue to serve on the board of the New York-based national organization. The labor Seder will be led by Rabbi Barbara Penzner, co-chair of the New England branch, with Ashley Adams, a staff member of the Massachusetts Teachers Association. Penzner is the longtime rabbi at Temple Hillel B’nai Torah, a Reconstructionist congregation in West Roxbury, and also chairs the New England JLC’s rabbinic advisory council. Participants will read aloud from a Haggadah adapted by the New England JLC that draws parallels between the Passover story of the ancient Israelites’ exodus from slavery and the labor movement’s history of fighting for fair wages and safe workplaces. Also being recognized this year is Marya Axner, who is stepping down as the group’s regional director after 12 years. The gathering will honor Rabbi Jill Jacobs, executive director of T’ruah, the Rabbinic Call for Human Rights, and Brian Doherty, secretary treasurer/general agent of the Metro Building Trades Council. Siegel is widely admired across the state’s legal, labor, and Jewish communities, according to Burton Rosenthal, a Swampscott resident and labor lawyer who’s known Siegel for decades and is a longtime partner at Segal Roitman. “He’s a lawyer’s lawyer who displays a level of judgment that really stands out,” Rosenthal told the Journal. “He has built a bridge [between the Jewish and labor communities] like no one else and he does it with humility,” added Rosenthal, who has provided pro bono legal services to Cohen Hillel Academy in Marblehead. A regular at labor Seders over many years, Rosenthal finds the event heartening. It’s “a statement of support for the two communities of each other. It makes you feel darn good,” he said. Founded in 1934 by Yiddish-speaking immigrant trade unionists, in its early years the Jewish Labor Committee helped rescue European Jewish and union leaders persecuted under Nazi rule and later supported refugee resettlement. It also has strong and historic ties with Israel’s labor movement. The New England chapter began in the 1950s. Siegel and Axner said they are especially pleased that younger Jews are increasingly attracted to the work of the New England chapter. They have “energized our work and animated our spirit,” Siegel said. He attributes their interest, in part, to the “starkness of the equality gap that has become more apparent” in today’s economy. Young Jews also are discovering common cause with Jews from earlier generations who were labor activists, he and Axner suggested. Reflecting back, Axner said with the support from the JLC, union workers get to know people from the Jewish community they wouldn’t meet otherwise. It’s especially important to bolster these relationships at a time of rising anti-Semitism, Axner said. Thank you for writing this article and for sharing the wonderful work of Don, Marya and the New England Jewish Labor Committee. 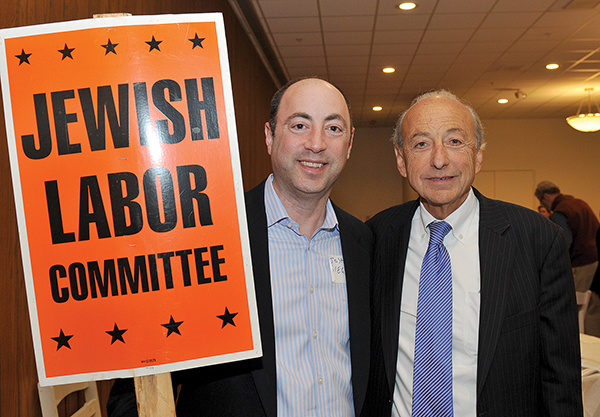 The NEJLC plays a unique and important role in the Boston area, educating the Jewish community about labor issues, and the labor community about the key role that the Jewish community continues to play in the labor world.